NEW! Automatic Adjustment (AA) –Automatically compensates for lining wear throughout the full thickness life of the linings. It eliminates the time required to manually adjust the linkages for brake shoe lining wear. NEW! Automatic Equalization (AE) –Automatically equalizes and maintains running shoe clearance and maintains proper running, which provides balanced braking and equal brake pad wear. Both MSA and MST types can be fitted with assisted hydraulic override to produce a dual-purpose industrial brake. 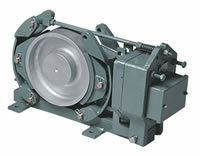 This hybrid brake is useful for Gantry cranes, EOT bridges and similar mill duty applications where dual control and/or emergency stopping and parking are required.